What does Akhenaten’s titles reveal about him? These temples signified a departure from traditional architecture open to the sky. He also innovated the methods and styles of construction. - Recent excavations at Hatshepsut’s mortuary temple at Dier el-Bahari has revealed a sun alter on the topmost level dedicated to the Aten. Discuss the nature of Akhenaten’s religious reforms? How are Pharaohs typically depicted in art? - King now represented with a long thin head with almond eyes and fleshy lips supported by an elongated neck. He had swelling breasts, broad hips, plump thighs and long, spindly legs. Initially depicted as a falcon headed god, now shows him as a globe with arms spreading to embrace the royal family (Akhenaten, Nefertiti, their children and Tiye) and offer the ankh (life) to them. - Anatomist Elliot Grafton Smith suggested that the Pharaoh suffered from a physical disorder called Fröhlich’s syndrome. Though sufferers are usually mentally retarded and sterile, which the king was neither. - Canadian scholar Alwyn Burridge suggested Marfan’s syndrome, but that would have resulted in early death of heart weakness or blindness for his children, which was not the case. - Other scholars believe it was the result of artistic changes throughout his reign. - Scholars who subscribed to this view felt that the king was too preoccupied with his religious changes to bother with foreign affairs. - It is clear that Akhenaten marinated traditional foreign policy in Nubia, including the construction of towns and military campaigns. - Another town at Kawa was named Gem pa- Aten, like the temple at east Karnak. - In year 12 the army, under the command of the victory of Kush, Thutmose, was sent to Nubia to put down a rebellion there. This is recorded on a stela at Buhen. - Akhenaten has long been blamed for losing Egypt’s sphere of influence in the Syria- Palestine region. - In the early years of his reign his armies appear to have campaigned against the apiru outlaw bands of Palestine, some of whom the king resettled in Nubia. - Akhenaten was the first pharaoh to adopt a similar policy of resettling Nubian rebels in Palestine. - Akhenaten is also known to have fought at least one war against the Hittities, the rapidly growing power in the region. - Reliefs depict Egyptians besieging cities, while Akhenaten himself is shown riding in his chariot and killing prisoners. - A.R Schulman believes that the war must have taken place within the first five years og Akhenatens reign, the period when the temples were decorated, and could have involved the retaking of cities captured by Adbi – Ashirta of Amurru. - Rib-Addi of Byblos, who writes effectively in the Amarna letters, records this victory. His letters recorded repeated requests for Akhenaten to come to his aid against Aziru of Amurru who was taking advantages of Hittite undermining in the region to increase his own territory. 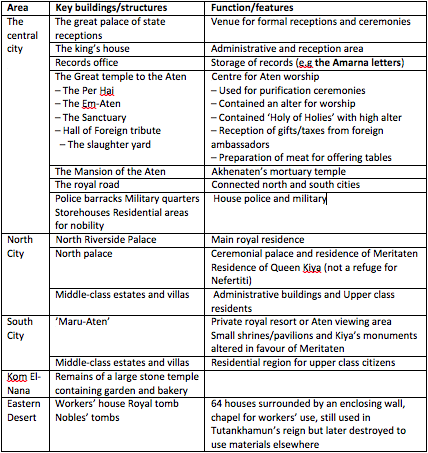 Over – emphasis on the complaints of this vassal king has encouraged the view that Akhenaten neglected his empire. - Aziru of Amurru was eventually summond to Egypt to answer the complaints and was detained for a long time. On his return, his subsequent defection to the Hittities indicates the difficulty Egypt encountered in maintaining control over the distant parts of its sphere of interests in Syria Palestine, particularly in the face of aggressive Hittites expansion. - It is now clear that Akhenaten followed his father Amenhotep III’s policy of maintaining diplomatic ties to avoid warfare in the Near East. He married a Mitannian princess as his father had done and continued the diplomatic correspondence with Egypt’s vassals, as well as the Mitannian King Tushratta. - His policy of limited military action containment enabled Akhenaten to maintain Egypt’s influence in Syria and the Levant at a time when expansion was not a feasible option. - There is no evidence that trade was disrupted during this period. - The Amarna letterns indicate that the tribute levied on vassal states, which had been continued to be paid. - Archaeologist evidence, especially the remains of ancient shipwrecks such as the Ulu Burun wreck off the coast of southern Turkey, points t a well established trading network between Egypt and her eastern Mediterranean and Aegean neighbours. - Deliveries of goods were accepted from Kharu (Asia), and with Kush (Nubia) as well as Libya and the Aegean. Whether these goods were diplomatic gifts, or tributes, it is clear that Egypt was maintaining economic links with its neighbours. – The tomb continued to be equipped with grave goods such as food, drink, furniture and personal belongings. Other aspects, however, were modified or eliminated because they were incompatible with the new state cult. These key changes are summarised below. - Previously Egyptians had hoped for an afterlife that could have taken a variety of forms. – She was apparently considered the head of the family household e.g. the Boundary Stelae describe the children as being ‘under the authority of the queen’. Nefertiti’s identification with Smenkhkare is particularly controversial, as historians such as Harris and Samson argue Nefertiti to be Smenkhkare, while Redford and Dodson argue against this. Akhenaten was only ever depicted in the company of his daughters although it is believed he also fathered two sons – Smenkhkare and Tutankhamun.